Event: The SATCON Connection, For the twelveth consecutive year, the satellite industry will be converging on New York City for the SATCON exhibition and conference. SATCON 2013: Industry CEOs and future leaders set the course at SATCON where compelling content, industry-leading exhibitors, partners and satcom end-users connect. On September 6, 2013, an Orbital Sciences’ Minotaur V launch vehicle boosted the $263 million Lunar Atmosphere and Dust Environment Explorer (LADEE) mission skywards to engage in a study of the Moon’s thin exosphere (an atmosphere that is extremely thin and tenuous where molecules do not collide with one another) and lunar dust environment. Don White has been instrumental in supporting and then leading Astrotech’s satellite processing operations since 2005. As Vice President and General Manager of Astrotech Space Operations, Mr. White oversees the subsidiary’s rigorous schedule of processing numerous spacecraft annually. The general public and the electric power utility industry are unfamiliar with Space Solar Power and advanced aerospace capabilities. The aerospace industry is, likewise, unfamiliar with electric power’s operational demands, regulatory restraints and critical issues. Alaska’s wide-open spaces and spectacular landscapes are high on the list of qualities that make this state a singular place to live. These same vast distances and rugged terrain also make Alaska a difficult place to operate businesses, especially when basics such as high-performance Internet and data connections are critical to success. The CleanSpace One satellite has a new ally in its mission to clean up space debris. École polytechnique fédérale de Lausanne (EPFL) has entered into a partnership with Swiss Space Systems (S3) and the company will invest 15 million Swiss Francs (CHF) in the project and will launch the satellite into orbit. Dr. Arunas Slekys is vice president of Corporate Marketing, as well as vice president and general manager of the Russia & CIS Business for Hughes, a wholly owned subsidiary of EchoStar Company. In these dual positions, he is responsible for managing all of Hughes marketing and advocacy initiatives worldwide, along with overall P&L responsibility for the company’s broadband satellite business in Russia, Ukraine, and the CIS countries. 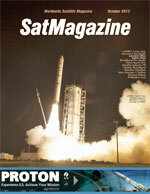 The unofficial start to the satellite industry’s business year within the U.S. is fast approaching with SatCon 2013 (IBC globally). With that in mind, now is the time to start thinking about engaging a focused public relations campaign. Such a decision can come with questions, false beliefs, and possible misunderstandings. What I am attempting with this article is to provide an honest and blunt assessment to what PR is, is not, and how it specifically benefits the satellite market. During challenging times in business, shouldn’t all of the oars in the boat be used to propel a company’s forward momentum? To safely navigate through the bumpy water, let’s discuss the relationship between two important oars: Best Practice Recruiting and Marketing. The Importance Of Proper Alignment, By Sam Fasullo, Satellite Product Manager, Norsat International Inc. Although a satellite’s footprint covers a large area, it is imperative that your satellite terminal be aligned in the exact direction of the satellite to ensure a precise transmit path and to maximize signal strength for the receiver. If the terminal is slightly out of position, signal strength could be reduced, causing the received signal to be unusable. In addition, an improperly aligned terminal could affect adjacent satellites, as the transmitted signal could interfere with their operation. This interference could potentially cause issues with your satellite service provider and you may be prevented from operating your terminal. In 2011, the United States experienced 14 weather disasters costing $1 billion or greater, more than occurred in any other year on record. The second-greatest number occurred in 2012, with 11 billion-dollar disasters. In 1993, Walter Kistler and Bob Citron founded Kistler Aerospace for the purpose of developing a fully reusable launch vehicle capable of achieving an Earth orbit at a minimal price point.